Alleged to have physically assaulted his girlfriend, the Chinese actor regains freedom after having been detained for a month. A month after being detained by Japanese authorities, 27 year-old Mainland Chinese actor Jiang Jinfu (蔣勁夫) is now a free man. Japanese model Haruka Nakaura has dropped domestic violence charges against Jinfu, as confirmed by his lawyer. On November 28, Japanese television stations reported about the actor turning himself in at a police station in Sugamo, Tokyo with admissions of domestic violence. With Nakaura posting pictures of her injuries on Instagram and claiming he has caused her to miscarriage, the case has fueled much heated discussions both about the actor-model’s alleged misconduct and wider social issues. In an Instagram post, Jinfu wrote, “Life is a like dream. When I heard that you came over I had a shock…thanks, old friend, though you shouldn’t have. I could still see a sliver of the blue skies when I was inside, but all I could feel when I reached out were cold metal grills. 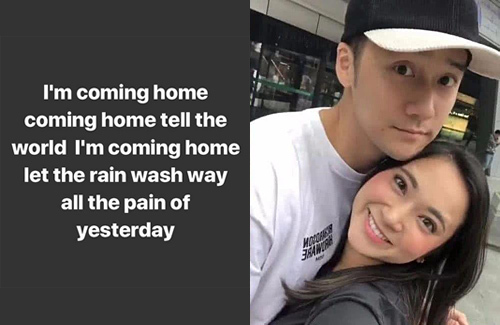 When you are out, don’t brave the rain to get home; go find someone who will hold the umbrella for you.…” The ambiguous reference to the “old friend” led some fans to speculate that he and girlfriend Nakaura have since mended their relationship. As Japanese detention centers do not allow the use of electronic devices, Jiang probably wrote the post upon release. Media reports surfaced that Jinfu was released as he had reached a settlement with the victim. Afterward, Jinfu’s representative lawyer also said on Weibo that he has received a decision from the Japanese prosecutors on December 28 stating that Jinfu would be released without being charged, thereby resuming legal freedom. He also revealed that that if all goes well, Japanese prosecution will officially announce their decision to drop all charges against Jinfu, adding “This means that Jiang Jinfu will not have any records of criminal charges having been made against him in this incident,” However, the lawyer has since deleted this post. As of press time, reporters were unable to get in touch with his representative lawyer.